Lesotho’s Constitution prohibits Lesotho citizens from holding the citizenship of any other country. Basotho who want to become citizens of another country must renounce their Lesotho citizenship, giving up certain rights and benefits to which Lesotho citizens are entitled. Noting that Lesotho is losing social and economic benefits by not allowing dual citizenship, the government has submitted to Parliament a bill to amend the Constitution to allow for dual citizenship (Post, 2018; Sunday Express, 2017). The World Bank (2017) estimates that remittance inflows to Lesotho have dropped from a high of U.S. $647 million in 2011 to $367 million in 2017, including $331 million from South Africa. As Lesotho embarks on a highly anticipated multi-sectoral reform process called for by the Southern African Development Community (SADC) in an attempt to bring lasting peace and stability to Lesotho, dual citizenship counts among constitutional issues that will be debated. 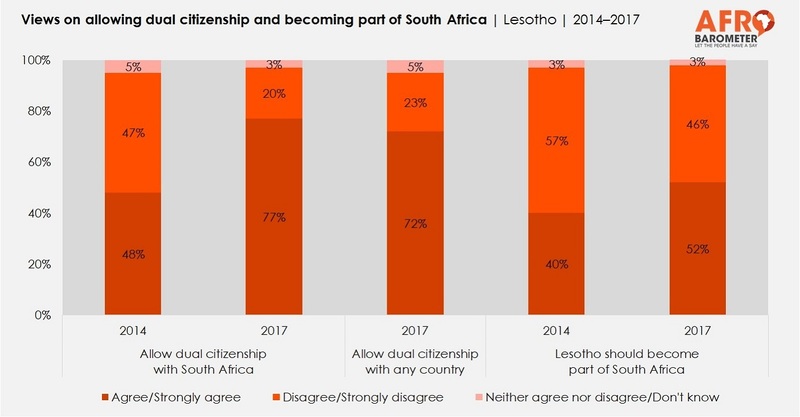 Results of a new Afrobarometer survey show strong – and increasing – public support for legalizing dual citizenship with South Africa, as well as a clear preference for legalizing dual citizenship in general. Moreover, the number of Basotho who say their country must become part of South Africa in order to realize meaningful development has grown to a majority. Among the four in 10 Basotho who have considered emigrating, most say they would most likely move to South Africa to find work.